NEW YORK - January 5, 2016 - Blaze, AJ and Zeg race back onto the screen for more dino-mite, S.T.E.M adventures in Blaze and the Monster Machines: Rev Up and Roar! available on DVD February 16, 2016. Blaze and his pals make their third DVD appearance in this exciting collection of episodes featuring new dinosaur and monster-truck friends and of course plenty of science and math knowledge! 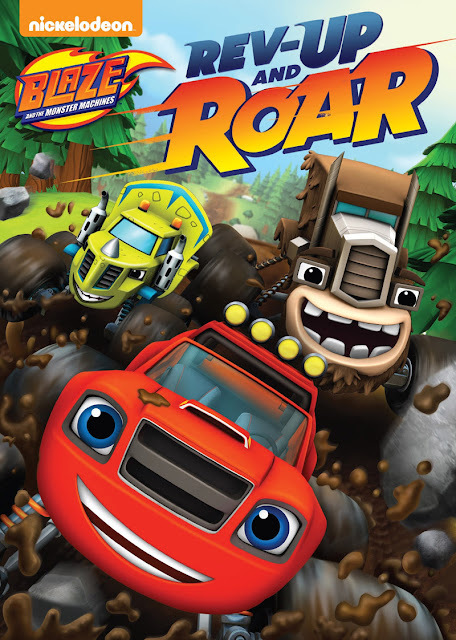 Created by Nickelodeon and distributed by Paramount Home Media Distribution, Blaze and the Monster Machines: Rev Up and Roar! races onto DVD on February 16, 2016 for the suggested retail price of $14.99. Zeg and the Egg - Zeg is out smashing things with Blaze and AJ when he finds a tiny dinosaur egg. The three friends must embark on an epic journey across a prehistoric landscape to return the truckodactyl egg to its mother. Dino Dash - Blaze and AJ are playing with their friend Zeg when he accidentally gets blasted by a geyser into a faraway mud pit. It's up to Blaze and AJ to save Zeg using an engineering design inspired by their new dinosaur truck friends to rescue him before he sinks into the mud. Gasquatch - When Blaze and AJ head off into the woods to find a missing ball, they discover and befriend a misunderstood monster truck named Gasquatch. Gasquatch and his new friends travel back to Axle City where he earns the love and respect of all the trucks in town by sneezing away a storm cloud. Dragon Island Duel - It's the day of the Dragon Island Duel, a one-on-one race between Blaze and Crusher across tropical Dragon Island. Crusher cheats and sends Blaze away before the race, leaving AJ to rescue his best friend and bring him back to the starting line. B was so excited when this awesome DVD plowed into our living room. He couldn't wait to check it out. He's a big fan of Blaze, and since we ditched our cable, we love being able to watch Blaze and the Monster Machines on DVD! This disc is filled with lots of great episodes, full of adventure and lots of fun! What I love most about these episodes, is that they all focus on how to be a good friend. B is at that age where kids are starting to discover that they have different likes and dislikes, and sometimes, we have to manage 'my friend was mean to me' situations after school. These episodes provide wonderful examples of what it means to truly be a good friend and lend a helping hand. No parent wants to see their child struggle with hurt feelings, so these cute episodes help kids explore their feelings, and help parents talk to their children. Plus, these episodes are packed with lots of learning fun- perfect for preschoolers and beyond. 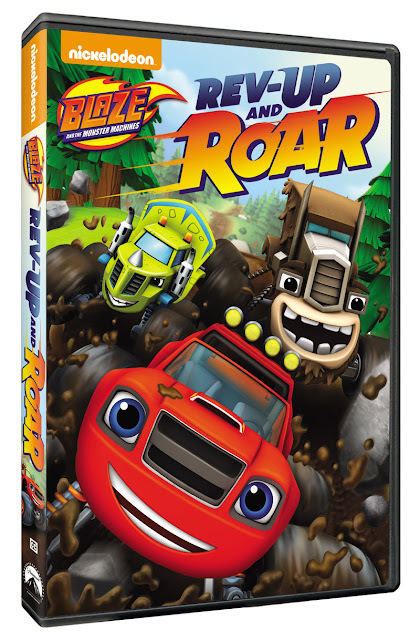 Look for Blaze and the Monster Machines Rev Up and Roar wherever home entertainment discs are sold. You can learn more about Blaze and the Monster Machines over at Nick Jr. Connect with Nick Jr. via Facebook! 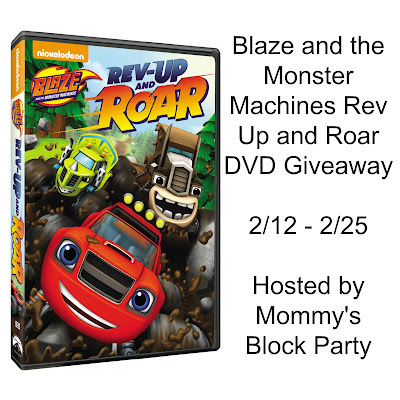 One lucky reader will win their own copy of Blaze and the Monster Machines Rev Up and Roar on Nick DVD. Giveaway is open to US residents, 18 and older. Use the RC entry form below to enter for your chance to win! MBP is not responsible for prize fulfillment. Please see our policies page for details. Special thanks to our friends at Nickelodeon for sponsoring this great giveaway for our readers! We teach them to treat everyone with respect and kindness. I would love to win this Dvd For my Young Grandsons. This is their type of DVD!! They love the Cars Movies and My one Grandson even has all the Cars Characters on his wall plus he sleeps in a Cars Themed Bed !! So Cute!! When my Daughters were little Girls I would buy them little tables and chairs.. Then I would get them little cup and saucer play sets. They would set their table for their guests and for their own little Dolls! They would pretend they had company and were feeding and giving their guests Tea or Coffee. To me that is a hands on training of having friends and inviting them over!! They loved it!! My sons love watching this show! I also read them books that would be leaning towards good Friendships. 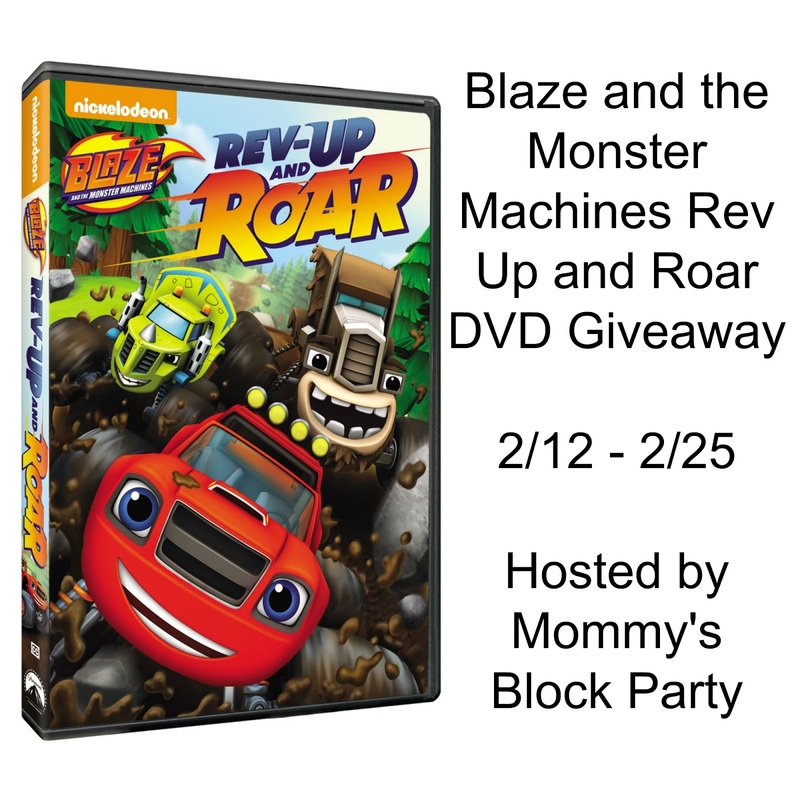 I would love to win this DVD for my son, he loves watching Blaze, and I love that he learns so much just from watching this show. I'd love to win this for my nephew because he'd have fun watching it and also learn good messages about friendship.